Despite the fact that you've got the Moon in your work sector and Jupiter's last weekend in your financial sector means you'll need to keep your work and money hats on, there is a new lightness in the air today that makes it hard to take anything too seriously. It's Mars' departure from your financial sector that takes a lot of pressure off you and your relationships, while leaving you with a clearer sense of knowing what you want from your relationships and what they need from you. However, it's today's adventurous lunar vibes that really make the difference. 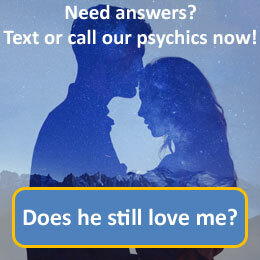 Call 09069 669 610 for a more detailed reading with our psychics today. Capricorn, the goat, is the tenth astrological sign in the Zodiac, originating from the constellation of Capricornus. Capricorn is considered a "feminine," negative sign. It is also considered an earth sign and is one of four cardinal signs. Capricorn is ruled by the planet Saturn. Some find that physically, individuals born under the sign of Capricorn tend to have dark hair, steady eyes, a dark complexion, capable hands, and prominent cheekbones. Capricorns are hard working, capable, ambitious and strong. At times however, they can be dry, aloof and melancholy.